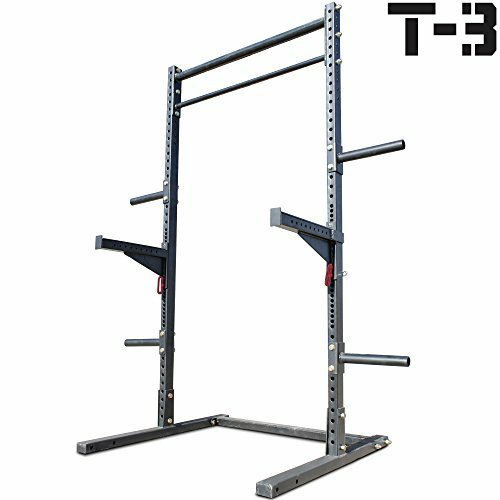 Titan T-3 Squat Rack w/ Safely Spotter Arms Weight Lift Stand Strength Pull Up by Titan Fitness at Strongman Pictures. MPN: HDSQUAT1-HDSQUAT2-HDSQSA. Hurry! Limited time offer. Offer valid only while supplies last. The Titan Squat Stand will help you work out safely and efficiently while performing squats, military press, bench press, curls, pull ups, and more. The Titan Squat Stand will help you work out safely and efficiently while performing squats, military press, bench press, curls, pull ups, and more. It offers a wide range of positions helping to accommodate a wide range of height and exercises and the additional Spotter Safety Arms deliver extra protection for those who like working out alone. The bolt-together construction allows you to easily transport and fit the rack in to any room or basement! - (#1) pull up bar: 1 1/4"
- (#2) pull up bar: 2"
- Height of pull up bar: 82"
- 2"x3" steel tubes- (#1) pull up bar: 1 1/4" - (#2) pull up bar: 2"
We need your phone number for the trucking company to schedule delivery. Without it there will be delays!